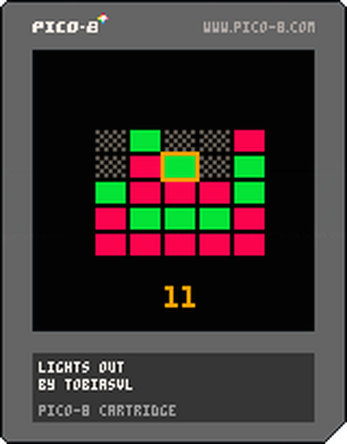 The classic Lights Out puzzle game for the TweetTweetJam. The PICO-8 source code fits in two tweets (560 characters). Your goal is to turn all the lights off. However, each light toggles all four adjacent lights as well. Lights Out Classic: Lights toggle between off and on (red). Best solution is 15 moves. 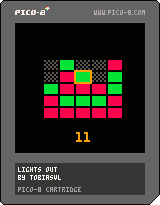 Lights Out 2000: Lights toggle between off, red and green. Best solution is 18 moves.